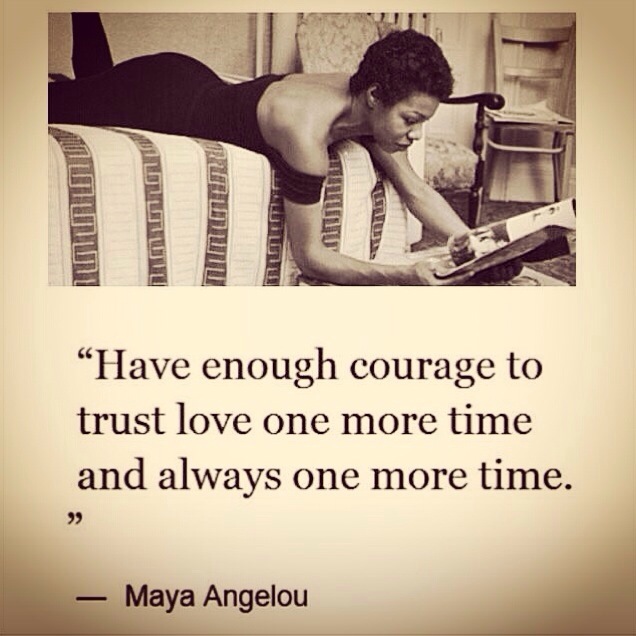 I fell in love with Maya Angelou in my second year of college in an advanced literature class. I had this fantastic professor who insulted us all with love on a bi-weekly basis, in an attempt to open our eyes. I’ve read many a poem by Miss Angelou, but it was her popular book “I Know Why the Caged Bird Sings,” that just ripped my heart to shreds and put it back together again. It was this book that first jolted me awake and made me realize how messy and dirty life is. After Angelou was abused, she stopped talking – an imperfect response to an awful situation. This was the first time I realized that my imperfect reaction to my own childhood was perfectly acceptable. That we are all human, and mistakes don’t define my future. I can’t tell you how heartbreakingly wonderful this was to discover. On a personal level, I’m very appreciative to have had this beautiful soul in our world. It’s so often her words that enable me to open my heart to what’s difficult. I can’t imagine the immensity that her words have had on the entirety of our world.